Halvarssons is a terrific company. The brand is not so well known over here as it is in Scandinavia, but those who do know it quickly become converts and fans. Technical textile garments are probably their forté and, whilst it has to be acknowledged that the brand operates a rung below somebody like Rukka, we would suggest that they offer 90% of the quality for 50% of the money. That is to say, that their gear functions at the highest levels, but always punches above its weight when it comes to cost considerations and value. For many years, the company’s best-selling suit has been their much-lauded Prime jacket and its matching Prince pant. For all but the highest mileage commuters and professional riders, it was in our view almost certainly the the best suit on the market. It was, and is, incredibly comfortable to wear. The waterproof membrane was excellent whilst, for abrasion resistance, the suit material was backed with a material call Hi-Art that increases the strength of a textile fabric by up to 500%. The suit also has great venting, especially once you have removed the zip-in Outlast inner jacket. 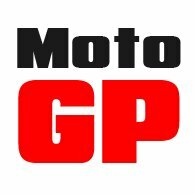 The Prime and Prince offered everything the leisure motorcyclist might need. It’s only weakness, as it were, was that it was a drop-liner suit so, in the heaviest of downpours, it would wet out. 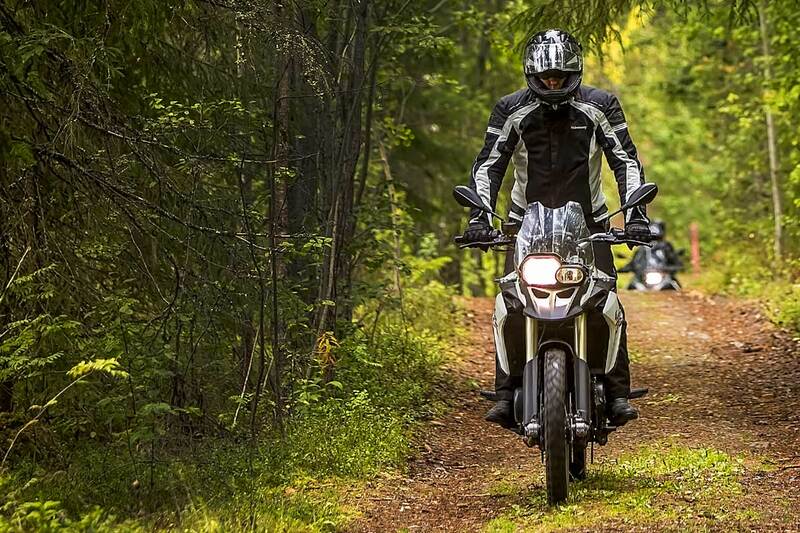 The answer was always something from the likes of Rukka, Stadler or Klim. The problem was that all their suits came in at at least twice the price of the Halvarssons pairing. Well that was until now, and the arrival of Halvarssons new laminated suit. The new jacket is called the Wolf. The pant is the Wish. 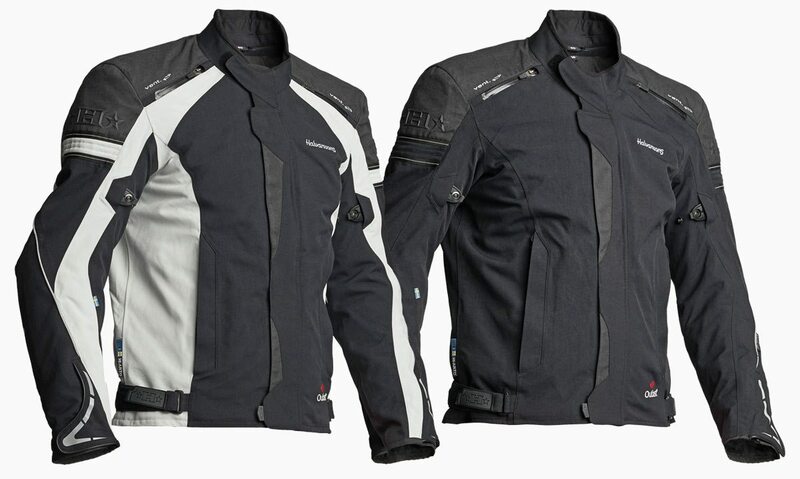 Traditionally, there have been two main downsides to laminated (or bonded) motorcycle clothing. The first was the price. It’s not easy to produce a laminated garment, and so the price has always been high. Some manufacturers have done it on the cheap, although sometimes with disastrous results, but £700, £800 or even £1200 for a laminated jacket is not unheard of. The second problem with laminated garments has been comfort. Gore-Tex’s Pro Shell laminated fabric, for example, whilst excellent in terms of waterproofing, is inherently stiff, as you might expect when three different layers are bonded onto one another. The benefits of laminated clothing are well documented, but so are the weaknesses. For some these suits have simply been too expensive. For others, they have not been particularly nice to wear, and if you’re a casual, weekend rider this can be the determining factor. But Halvarssons has turned the market on its head a little by introducing a new laminated suit that is not only as comfortable as a drop-liner product; they’ve also managed to bring it out at an almost unbelievably low price. The jacket, for example, costs £519. The similarly spec’d Prime costs £459. A premium of just £60 therefore. And that’s pretty outstanding. The difference between the new laminated Wick pant and the drop-liner Prince pant is just £50. Again, amazing. So how have they managed to do this? Frankly, we don’t really know how, but we suspect that, in the first year, Halvarssons is trying to make a point, and has therefore priced the outfit particularly competitively. What we should point out that this new suit is not made from a 2-layer laminated material, rather that the 3-layer system used by some of the other brands. This does not affect the waterproofing. But it does make for a softer, more flexible material. In theory, a 2-layer garment will breathe better than a 3-layer one, but that also depends on the membrane itself, according to Gore. If there’s a potential weakness with a 2-layer laminate, it’s that it is less robust. Frankly, we would still expect a 2-layer garment like this one from Halvarssons to give many, many years of service, but with the Halvarssons suit you’ll get a standard two year warranty, as opposed to the five you get from Rukka. If you’re a professional rider or a heavy-duty commuter doing more than 20,000 miles a year, then a case could be made for the 3-layer route, but for most riders a 2-layer suit will be more than up to the job, and nicer to wear. So what exactly is the Wolf jacket, and who is it aimed at? Well we would say that it’s an all-round suit that’s aimed at commuters, weekend riders and those who go on big tours. Like the Prime and Prince that went before it, it does just about everything, albeit the new suit will do it just a bit better in almost every respect. 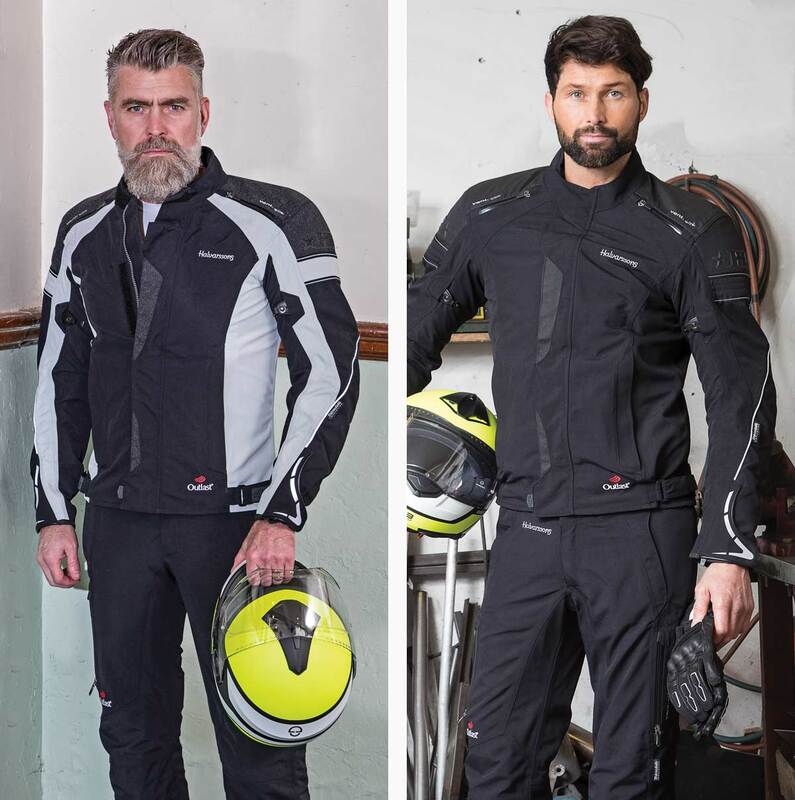 We suspect that it will appeal to many riders of big enduro or adventure bikers, although technically there’s a second laminated suit in the Halvarssons range that has a more specific ‘adventure’ remit. That suit is called the Luxor and Lux. In many respects, it’s similar to the Wolf and Wish but it has a slightly wider fit and better venting. It’s also a bit longer in the body. But anyway, let’s get back to the Wolf and Wish. The jacket is, as we have explained, a 2-layer garment. For extra waterproofing, the garment is Teflon coated. Teflon is a durable water repellent (DWR). Every textile motorcycle garment has a DWR, but Teflon is probably the best and longest lasting repellent on the market. The external material of the jacket is reinforced in all the key, most vulnerable areas with Halvarssons’ own anti-abrasion material that is known as Hi-Art. It’s not an aramid material like Kevlar, but it does a similar job in that it adds strength to a fabric. With a textile garment, the Hi-Art will increase the strength of the material by a factor of six (ie: 500%) so the Wolf and Wish are certainly highly protective. For impact protection, both the jackets and pants come with Halvarssons’’ latest safety armour that meets the highest CE level 2 standard. It’s much softer than their old armour; and it’s adjustable, so getting it in the right place will never be an issue. There’s no back protector as standard with the Wolf, but as always with Halvarssons’ jackets, we recommend the fitting of a D30 T8 protector. It fits the pocket perfectly, but is nicer to wear, and actually a few pounds cheaper, than the one that Halvarssons actually recommends. Of course, lamination is all about waterproofing, so obviously we would expect the Wick to be totally waterproof. The lamination utilises the company’s own Dryway Plus membrane, but it’s well proven and very comparable to Gore-tex. In truth, the Prime is pretty impressive in this respect, but in the heaviest, prolonged rainstorm the Prime would eventually become saturated, and reach a stage that we call ‘wet-out’. This won’t happen with the Wish. 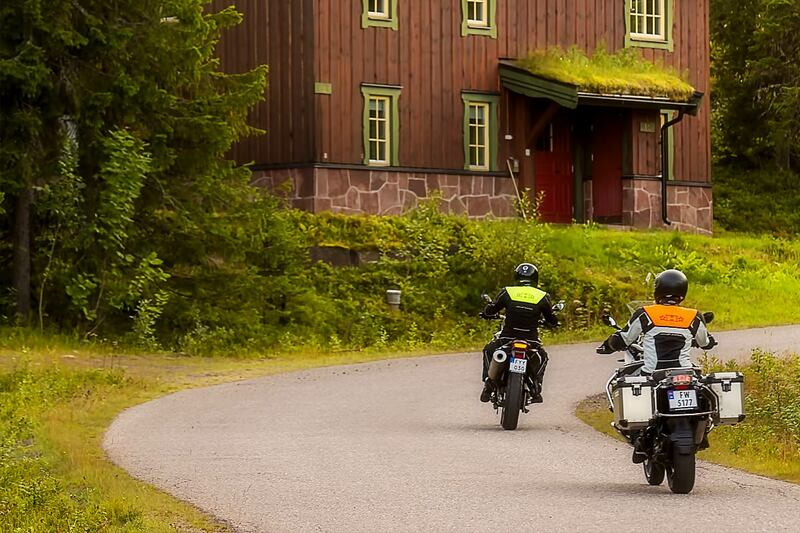 As a rider, you’ll stay drier for longer. And as the material won’t become waterlogged, the jacket won’t get heavy with water. The result is that you’ll stay not only drier, but potentially warmer too. And that’s because heat conducts through damp air far faster that it does through dry air. The other benefit, of course, is that a laminated jacket will dry out much faster than a drop-liner one. If you commute to work in the morning, a laminated jacket will always be dry when it’s time to go home. You can’t always be assured of this with a drop-liner garment. If the weather is cold, staying warm is also about staying dry so as we have suggested, a laminated jacket will keep you warmer if it’s wet and cold. But conversely, if it’s dry and cold, a drop-liner jacket might be warmer, because there’s a space between the outer fabric and the membrane in which warm air from the body can circulate. For thermal protection, the Wolf has pretty much the same inner jacket that is in the Prime. The jacket contains Outlast, which is a membrane comprised of paraffin molecules. It stores heat, and then passes it back to the body when it’s needed. The secret is to get heat into it before you set off on a cold day. It’s very clever stuff; it was first developed for the NASA space programme, and all we can say is that it works. It’s very thin, but it will keep you incredibly warm. The inner jacket is also infused with Thinsulate for even more thermal insulation. Slightly counter-intuitive is the fact that when you are really hot, the Outlast liner can actually cool you down by absorbing heat from the body. The bottom line is that for 90% of the time, you will leave the inner jacket in place. Only when it’s really, really warm would you remove it. And that’s because, only then can the air vents do their stuff. And, of course, this is another benefit of a laminated garment. A ventilation opening on a laminated garment will work better than one in a drop-liner garment, because incoming air won’t have to pass through the membrane that is situated on the inside of the vent in a drop-liner product. On the Wolf you get two long vents protected by waterproof zips, and a large exhaust vent in the back of the jacket beneath the yoke. So that’s the main stuff, but there’s lots of nice details that you might also want to know about. On the shoulders you get highly reflective panels that light up at night. There are adjusters on the sleeves to adjust the internal volume; and that’s important if you remove the inner jacket. It means you can quell any flapping. You also get adjusters at the waist to make sure you can get a snug fit, although personally we don’t think the system works as well as the one on the Prime. And as with the Prime, there’s a removeable hi-viz vest that comes as standard, and which can be worn when you need it. Obviously, the jacket can be attached with a full-length zip to the Wish pant. You could, of course, connect the jacket to any Halvarssons pant, but we would assume that most people will go for laminate top and bottom if they go laminate at all. We haven’t really discussed the pants in such great detail, but the reality is that, in all key areas, the Wish pant is almost identically constructed to the Wolf Jacket. The bottoms of the legs adjust, so that they should go over any boot and, as with the Prime pants, the Wish comes with braces.The only other important feature to point out is a leather panel on the seat itself. This will stop you sliding around on the seat, but it also provides extra abrasion resistance if you were to come off the bike. Size-wise, the Wolf goes from 46-66, which means it goes one size smaller than the Prime. The Wish pant goes from 46-62. There’s a short leg and a long leg waist, but no D-size; effectively an extra short leg. If you are particularly short in the leg, it might have to be the Prince pant. The ladies’ equivalents are known as the Walkyria jacket and the Wish Lady pant. Same in every detail, but the sizes go from 36-50 for the jacket and 36-48 for the pant. For women there’s a short leg version, but long-legged Amazonian sorts are out of luck, I’m afraid. So where does this leave us? What are our views, and what do we think about this new suit? For Halversson, the new suit will entice a whole group of new laminate-savvy riders, and that’s got to be good news for the company, but the bad news for the Swedish brand is that the new suit goes head to head with the Prime and Prince. And that’s not going to be much of a contest. In almost every functional and technical aspect, the new suit will be better, and at this price level,the extra £140 will probably not be a consideration. The Prime and Prince may well fit better, because it has a really neat adjuster system that allows the jacket to be worn comfortably but snugly. The older suit might be a tad more comfortable and a tad warmer, but in every other respect the Wolf and Wish will be a better bet. As it’s a brand new suit nobody really knows how it’s going to fit. Nothing is perfect on everybody, so if the suit sounds appealing, you’ll need to get yourself to a Halvarssons dealer to try it on. As the largest Halvarssons stockist outside of Sweden, we’ll be aiming to keep all sizes in stock for both men and ladies, and in both colours. A visit to Guildford is perhaps something you should plan for. We’re open, by the way, seven days a week.